Flat Panel TV Installations : Select Audio & Video Inc.
One of the major appeals of flat panel TVs such as Plasmas and LCDs is the space savings they create by hanging on the wall, out of the way. 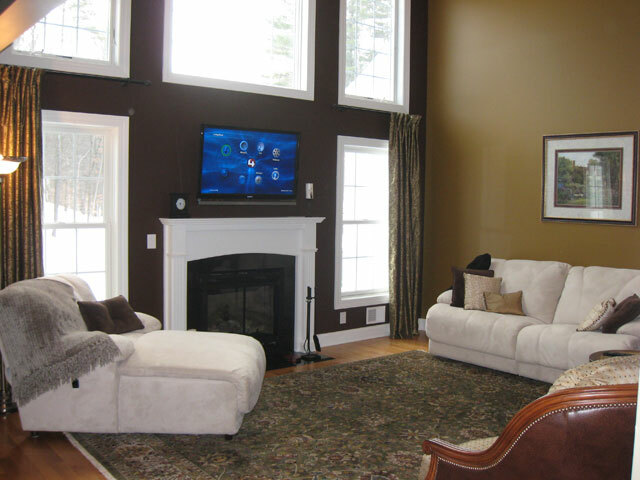 Select Audio & Video Inc. can install your flat panel TV on a wall with no wires showing. We will help you determine the right location for mounting your Plasma, LCD or LED flatpanel TV. Proper mounting brackets are always used. We can provide tilting, fixed, articulating and motorized mounts to suit your needs. Wiring is hidden in the walls for a picture perfect view. Plasma, LCD or LED Televisions installed wall mounted or on a table top stand, or in a piece of furiture with a lift. Integration of all audio and video equipment to your Plasma, LED or LCD Television. Wall mounted installation of your Plasma, LED or LCD TV or commercial display. Ceiling mounted installation for business displays and residential Plasma, LED or LCD TVs. Over fireplace or on fireplace mantel LED or LCD and Plasma TV installation. Furniture lifts to completly conceal or reveal your Plasma, LCD or LED display. Outlet move or relocation behind your LED or LCD TV. Consolidation of your remote controls into as few as possible using your existing remotes. Or we can provide you with various control options and programming to reduce coffee table clutter, and consolidate all your remotes into one.